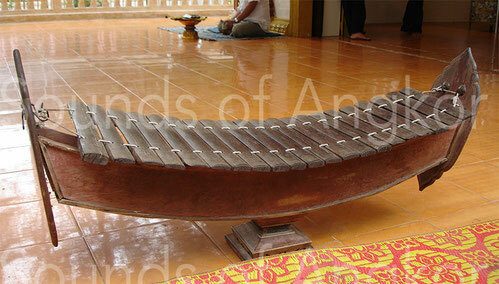 Xylophones - roneat aek / thong - Site de soundsofangkor ! There are two xylophones: roneat aek (or ek depending the author) and roneat thong. They consist of a boat-shaped wooden sound box on which blades (16 for roneat aek and 21 for roneat thong) made of red wood, rosewood or bamboo are suspended. They are arranged in a slightly curved plane along that of the sound box. Two links connect the blades, passing through each of them. They are tuned with wax mixed with lead shot deposited at each end. The blades are pounded with a pair of mallets whose heads are covered in rolled fabric. For the beginner, they are sometimes link together according a distance of an octave. The tuning depends of the generation of musician, the area of Cambodia and the nature of the orchestra. Formerly it was equiheptatonic but more and more it became diatonic under the influence of French colonization. This trend is confirmed today by the influence of Western music on the younger generations. 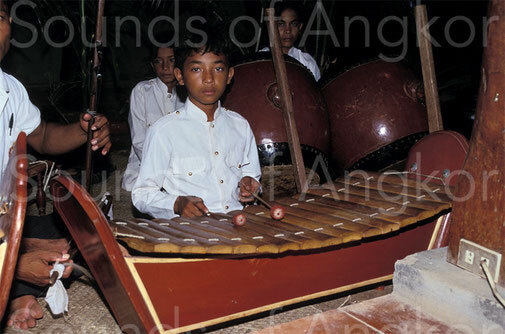 These instruments are used in the pin peat and mohori orchestras. In these ensembles are two xylophones roneat aek and roneat thong. The first is considered the female voice, the second the male one. The first one plays the melody with the mallets following each other at the octave. The second plays the accompaniment according to a dissociated playing between the two hands. How to recognize both instruments immediately? The two pieces of wood at the end of the resonance box (called khawals) of the roneat aek are triangle-shaped; those of the roneat thong rounded. The roneat aek is always placed to the right of the roneat thong. The first known image of a xylophone in Cambodia is depicted on a temporarily dated 16th c. fresco in the central sanctuary of Angkor Wat (bakan). Two instruments are already represented. 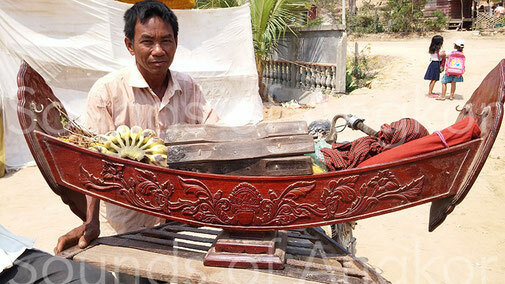 Such xylophones organized by couples are also played in Myanmar, Thailand and Laos.